This year has been amazingly good to me and has taught me so much! It has taught me that with determination, anything is possible. Never in a million years did I think I could run a mile, let alone several half marathons and a full marathon. It required a lot of patience and a lot of work and it was exhausting but in the end, every ounce of strength put into it fully paid off. First race of the year, Disney’s Princess Half Marathon. I was so nervous going into this race not only because I was traveling alone to Florida, but it was my first race EVER. I completely trained indoors for this half marathon on a treadmill. I dressed in costume as Cinderella, stopped to take pictures along the course with the Disney characters and came home with a shiny new medal. This runner’s high feeling lasted a really long time, and it was what got my new running addiction started. Running again in 2014! Second race of 2013, The Bucks County Half Marathon. This race was super-exciting, not only because it was right in my backyard (traveling for races can get so expensive) but because it benefited Autism Cares Foundation and also, my family was coming! I continued the training plan from the Princess Half Marathon into this half. The course was beautiful, scenic and if you’re a nature-lover, you will love this race. Well-organized and while the course is a bit challenging, it still is my half-marathon PR, by 17 minutes so yay to me! Gorgeous shiny medal to boot! Running in 2014. Third race of 2013, Broad Street Run. Seriously, I can not say enough good things about this run. It’s by lottery and I felt incredibly lucky to have gotten in! A few people I know decided not to run, worried after the events occurred at the Boston Marathon this year, and understandably so. Security was a top-priority for the city of Philadelphia and not a single second did I feel unsafe. Loved that Sweet Caroline was played at the start line (for Boston) and seeing Mayor Nutter giving high-fives at the start. The course is flat and fast and the spectators are amazing. If I’m fortunate enough to get into it in 2014, I’d be happy! The Electric Run Philadelphia didn’t happen. Canceled by the Philadelphia Fire Marshal due to lightning and rain. Registration deferred to 2014. Exciting and challenging at the same time! First time in the West Coast, going for my Coast to Coast medal and getting sick midway through the half marathon. Learned so much during this half and it taught my body what it liked and didn’t like. Met Olympic runner Jeff Galloway and ran with Sean Astin, Joey Fatone and Ali Vincent during the Disneyland Half Meetup. While I ran my worst half-marathon time, I had an amazing time and one I’ll never forget. Shed much sweat and tears through this training, which lasted all summer into the fall. First full marathon and I was super nervous. Great course, amazing spectators and so much support from the community that I was in awe. I truly love my city and hope to run again next year (if not the full, the half). Injured at mile 22, I was able to finish due to the wonderful spectators who encouraged me to get to the finish line. My biggest accomplishment: Going from running zero miles in 2012 to running over 400 miles in 2013. I can’t wait to see what 2014 has to bring. 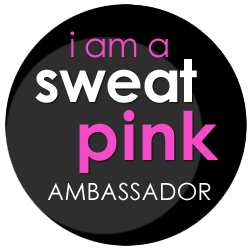 Announcement: I’m a Sweat Pink™ Ambassador! Much to my amazement, this morning I received an email from the founders, Jamie and Alyse, of Fit Approach that I have been chosen as a Sweat Pink™ Ambassador. * Natural leaders. They motivate those around them to achieve their best, and set an example of healthy, positive living. They set up running clubs for their friends, and organize gym dates early in the morning or after work. They get their co-workers to try yoga, and to order fruit instead of donuts for meetings. * Passionate. Whether they go gaga for green smoothies or tear up the floor every day at Zumba, there’s something about living well that really gets them going, and their enthusiasm is infectious. *Curious. Always looking out for the latest fitness or foodie craze, eager to learn, connect, share, and discover. I’m delighted and honored to have been chosen to become a part of this amazing group of leading, inspirational women who make a difference every day.